I am re-posting this soup as part of my "Free Foods - Festive Foods" series for Sugarfree Sensations. Do visit their site for sugarfree and allergy friendly products this season. 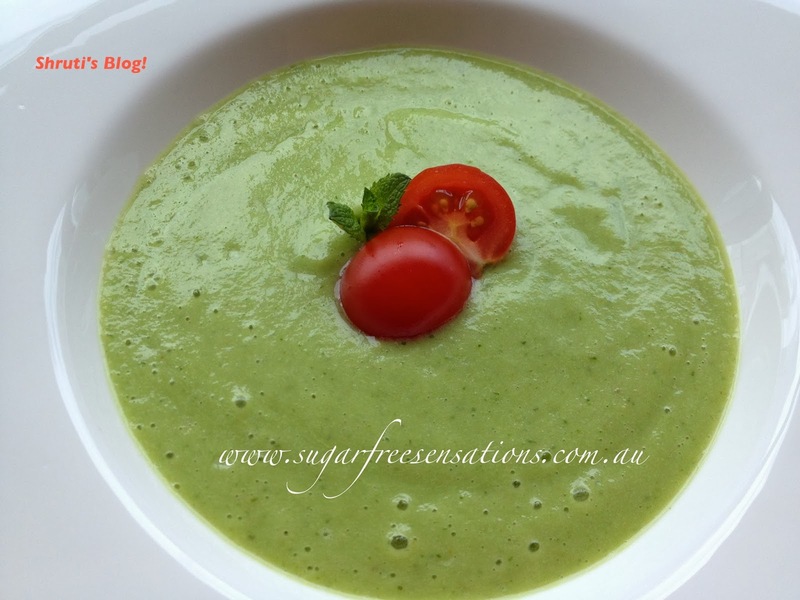 This cool soup is great for the Aussie scorchers. The combination is a natural – the water based, slightly astringent sensation of cucumber is effectively emulsified by the creamy smoothness of the avocado, and just as you are about to be lulled by an emollient spoonful, the mint unexpectedly spikes you. The cumin and tiny piece of green chilly provide the piquant quotient. Try this soup with a brown rice salad. You can serve it in paper cups and even take it on a picnic! Process the cucumber, avocado, mint, chilly in a food processor until smooth. Add as much water as you like, starting with a little and then gradually adding more. Give it one last zap and then remove into a bowl. Add the salt, pepper, lemon juice and roasted cumin powder to taste. Chill before serving with a garnish of mint and cherry tomatoes.